The OOSS Scholars Program is a partnership of OOSS, the American Academy of Ophthalmic Executives (AAOE), the AAO Young Ophthalmologist (YO) Committee, and AAO/AAOE. 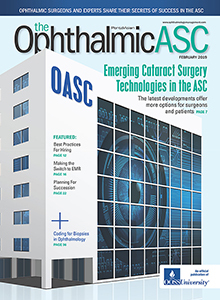 It is designed to support and mentor young ophthalmologists who are interested in future ownership of an ambulatory surgery center. The OOSS Scholars Program is offered in coordination with the AAOE and the AAO YO Program/AAOE Young Ophthalmologists Program. Applicants to the Scholars Program also may apply simultaneously for the OOSS Presidential Scholarship, which provides a stipend to cover registration fees and travel expenses to attend an upcoming OOSS Symposium and AAO/AAOE Annual Meeting. Scholarship winners will be selected by the OOSS president and executive committee. Scholarship recipients must attend the OOSS Symposium and AAO/AAOE Annual Meeting to receive their stipends. Those interested in applying to the OOSS Scholars Program and for the OOSS Presidential Scholarship in the future should subscribe to receive OOSS News eblasts and keep an eye on the OOSS online news page, where open submission periods are announced.